Caye Chapel - just 16 miles off the coast of Belize City - is one of the most prized potential developments. Over the years we've heard about so many plans for major resorts to put down sticks out there, but none of them have materialized. And, now there's another - and it's a Marquee name. A release issued today from a Mexican group called Inmobilia Desarrollos says that the luxury franchise, Four Seasons Hotel and Resorts has announced plans for the development of Caye Cualker. 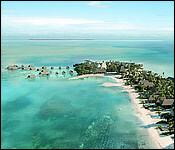 They say it will open in 2021 and will be called the "Four Seasons Resort and Residences Caye Chapel, Belize". The release says there will be 50 Private Estate lots, 35 Private Residences, and 100 guest rooms and suites. And, they add that golfer Greg Norman will re-design the island's 18-hole golf course. This is kind of a remix since we met Norman at Caye Chapel back in 2015 - when construction was supposed to start at the end of 2016 - but things, apparently, didn't proceed as planned. We'll take a wait and see approach on this one. Four Seasons is opening another new property in the Caribbean as the company embarks on what appears to be a concerted expansion push in the region. 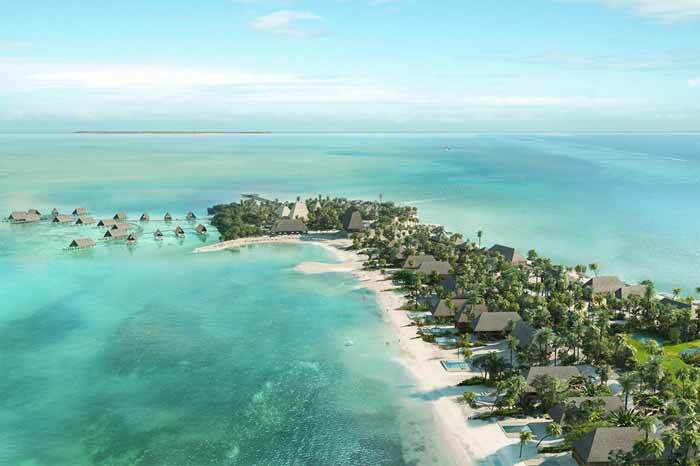 Four Seasons Hotels and Resorts has announced plans to develop Caye Chapel, a private island in Belize, with a mix of oceanfront estates, private residences and overwater bungalows. The project, which is slated to open in 2021, is the product of a partnership with Thor Urbana, Immobilia Desarollos and GFA Grupo Immobiliario, all of which are based in Mexico. The luxury development, called Four Seasons Resort and Residences Caye Chapel, Belize, will be a mix of 50 private estates lots, 35 private residences and 100 guest rooms and suites. Four Seasons Hotels and Resorts, the world's leading luxury hospitality company, announced plans for the development of Caye Chapel, a private island in Belize featuring magnificent oceanfront estates, private residences and overwater bungalows. Scheduled to open in 2021, the project is in partnership with Thor Urbana, Inmobilia Desarrollos and GFA Grupo Inmobiliario, three leading real estate development groups based in Mexico. Four Seasons Resort and Residences Caye Chapel, Belize will transform the intimate private island of Caye Chapel into a luxury destination for residence owners and leisure travellers, with approximately 50 Private Estate lots, 35 Private Residences, and 100 guest rooms and suites. Caye Chapel is located in the Belize archipelago in the Caribbean Sea, adjacent to the UNESCO World Heritage designated Belize Barrier Reef System, the largest reef system in the northern hemisphere. The island will feature an 18-hole golf course designed by Greg Norman in consultation with Lorena Ochoa, a Fabien Cousteau nature and conservation institute, a marina and private airstrip. "We are excited to be a part of the re-imagination of Caye Chapel into an exclusive luxury experience, and to do so in a way that protects and reinforces the natural wonders of the island," says J. Allen Smith, President and CEO, Four Seasons Hotels and Resorts. The 280-acre (113 hectare) island is outlined by 6 miles (9.7 kilometres) of white sand beaches and turquoise waters, and is located 16 miles (26 kilometres) from Belize City, either 30 minutes by boat or 10 minutes by flight. The island's marina and airstrip can accommodate private boats and planes for easy access by owners and guests arriving from further afield. A destination in its own right, the island also acts as a convenient base to explore the nearby cultural and natural sites of mainland Belize and surrounding cayes. For those looking to make their stays on the island more permanent, the development will include approximately 35 Four Seasons Private Residences and 50 Four Seasons Private Estates that owners can help design and build to their own preferences. Each lot will have private beach and golf course access, and owners can choose between a site on the east to enjoy sunrise or on the west for views of the sunset. The Resort will feature 100 guest rooms and suites designed by Studio Caban, including a collection of overwater bungalows. Myriad amenities include health and wellness facilities, two beach clubs, multiple dining and bar options with sea views, retail outlets, a young residents club, a marina, tennis courts and the 18-hole White Shark Golf Course designed and reinvented by Greg Norman and Lorena Ochoa. Guests and homeowners will be able to enjoy the exceptional natural aquatic environment around the island through boat expeditions, snorkeling, paddle boarding, diving and the on-site Fabien Cousteau Nature and Conservation Institute and Adventure Center. The institute will be home to research and education initiatives that guests and residents can participate in, including a 3D coral reef printing program. 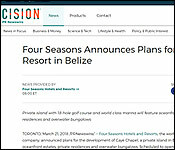 Four Seasons Resort and Residences Caye Chapel, Belize will be a welcome addition to the growing Four Seasons resort collection in Central America, the Caribbean and Mexico, including sister properties in Costa Rica, the Bahamas, Anguilla, Nevis and Punta Mita, Mexico.